A romantic comedy drama set in the high stakes world of business, Working Girl celebrates the power of the individual to succeed despite any lowly starting point. The film is an effective combination of character-driven boardroom drama, unlikely romance and clever, adult-oriented humour. In New York, Tess McGill (Melanie Griffith) is a working class Staten Island girl holding a job as an administrative secretary at a Manhattan investment brokerage. Just turning 30, Tess is smart, savvy and strives for admission into the firm's trainee program, but entry doors just slam in her face. A spark of hope is ignited when Tess is assigned to a new boss in the form of sharp young executive Katharine Parker (Sigourney Weaver). Katharine promises to take Tess seriously and help her advance, but then proceeds to steal Tess' idea for a major media acquisition deal. When Katharine is unexpectedly laid up in Switzerland with a broken leg due to a ski accident, Tess takes the opportunity to over-represent herself, taking over Katharine's office and wardrobe and playing deal maker between two major corporations, with help from mergers and acquisitions executive Jack Trainer (Harrison Ford). Jack and Tess push the deal seemingly towards success and start to develop romantic feelings for each other. But when Katharine reenters the picture, Tess is exposed and finds herself severely compromised professionally and personally. Directed by Mike Nichols, Working Girl is a corporate fairy tale, a Cinderella-in-Manhattan where the corporation is the castle, dreams can come true, and the poor but good girl from the 'burbs has to try and overcome a horrid wardrobe, outsmart the evil schemer, and aim to win the heart of prince charming. Written by Kevin Wade, the film mixes humour, romance and business in a slick and irresistible package, and unfolds as a breezy romp through the extreme sport of office politics, where knives are plunged into backs as a matter of course and always with an icy smile. Working Girl is also a quintessential piece of late 1980s filmmaking celebrating the decade of greed. Here executives are only as good as their last deal, barracudas like Katharine Parker slice through cocktail parties looking for their next victim, Jack Trainer and his ilk forgo sleep and crave the success of brokering an acquisition, boardroom deals are the pinnacle of excitement, and even the secretary aims for her piece of the me decade. Flattery, flirting and barely concealed sexuality are just more weapons in the business battlefield. Tess has the scrappy streetsmarts but not the education to join the game, but her desire to climb this particular corporate ladder is never questioned. Her sacrifices includes cutting her working class hair, dumping the gaudy jewelry, and breaking off with oily boyfriend Mick (Alec Baldwin), who conveniently cheats on her just as she is starting to carve out a new life. It is an open question whether Tess' friendship with fellow secretary Cynthia (Joan Cusack) will survive her desire to rise above the secretarial pool. The film chews heartily on several themes, including classism, careerism, women in the work force, the limits of ambition, and the rights and wrongs of the ends justifying the means. A unifying theme is the desperation to get ahead at all levels and at all costs. Just as much as Tess is eager to prove herself, Katharine and Jack are just as committed to their goals, and if nothing else, they serve as warnings of what Tess should expect once she wades into the dangerous waters of deal making. Tess McGill is probably Melanie Griffith's greatest role. She brings Tess to life with cat-like agility, smarts, and intensity. Griffith keeps the character anchored in Tess' working class roots, which represent a commitment to dogged persistence and an inability to compromise when confronted with two-faced sleaze. Harrison Ford provides a steady presence, while Sigourney Weaver has an absolute blast turning Katharine Parker into the seminal surreptitious corporate conniver, trampling on the likes of Tess with absolute glee. Oliver Platt (Tess' first boss), Kevin Spacey (a coke snorting lusty executive) and Olympia Dukakis (the personnel director) contribute small roles. Most appropriately, the impressively spiritual Carly Simon song Let the River Run won the Academy Award. 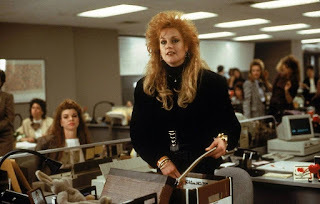 After all, Working Girl is an ode to the career that glistens in the high rise windows of the Manhattan sky, where all shall worship at the altar of the next big commission.